An Artist's Life For Me! 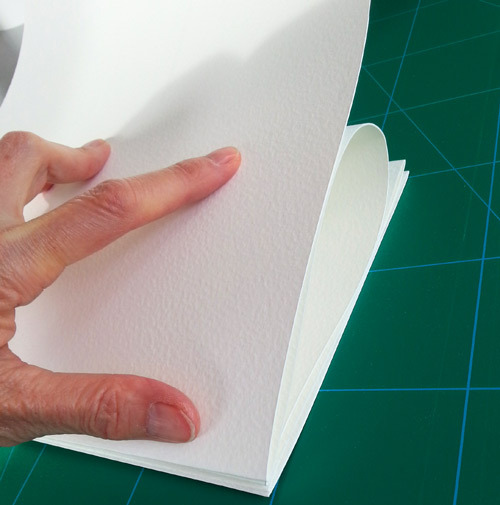 : How to Make 35 Concertina Sketchbooks! Although my residency doesn't start until the autumn, I wanted to get the sketchbooks made well in advance, in case of difficulties. 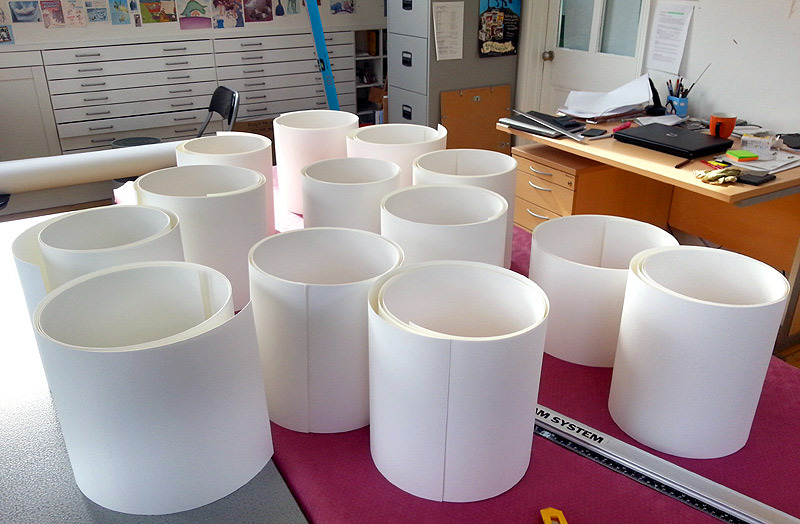 So, a couple of weeks ago, a HUGE roll of watercolour paper arrived in the post. 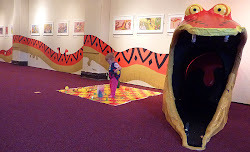 It was 10m long and over 1.5m wide: a bit of a nightmare to manoeuvre, but perfect for making concertina books, as you don't need any joins (usually the trickiest bit). This morning we got stuck in! We had to pull a 6ft table up alongside my work bench, just to have somewhere big enough to cope with rolling the paper out so we could work with it. Everything had to be scrupulously clean too - another nightmare. 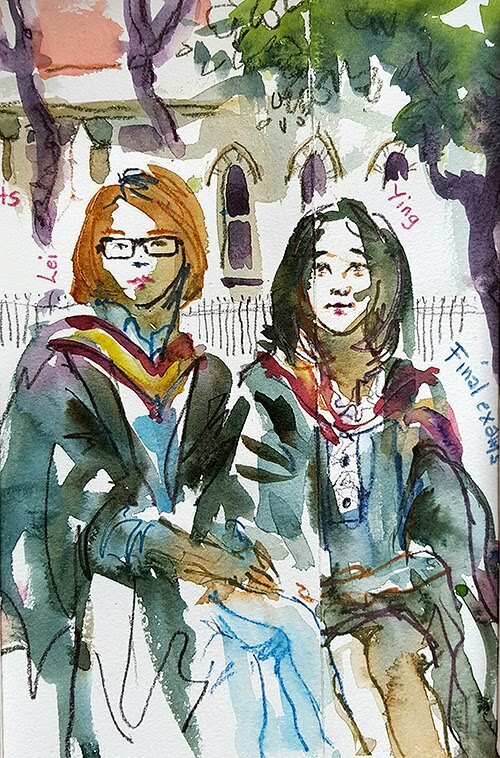 I had worked out that I would get 7 sketchbooks out of the roll's width, each a max of 2m long (so they would not be too unwieldy to exhibit at the university, when I'm done at the end of the residency). Given the roll's 10m length, that meant 5 sets of 7, so 35 books in total. 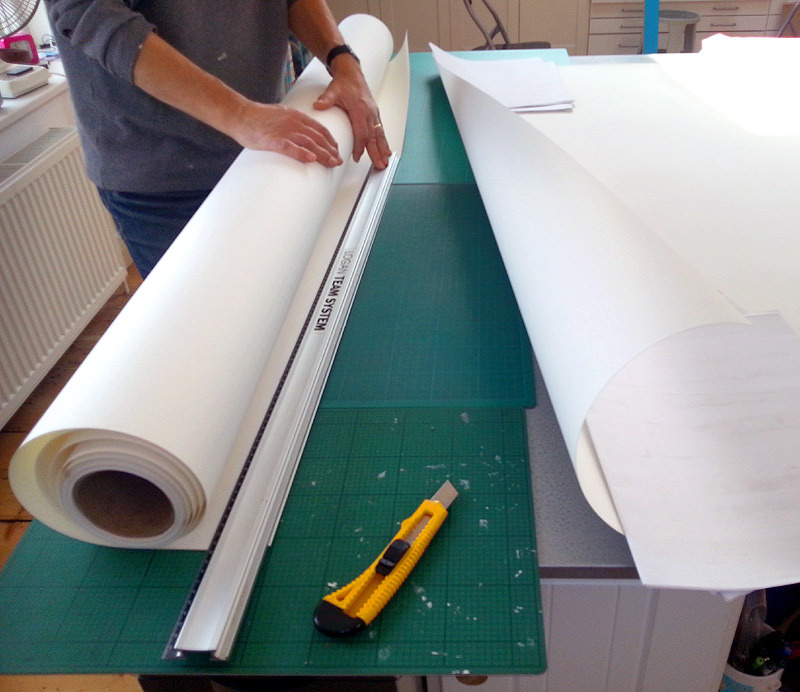 I decided to cut a couple of the 2m lengths from the roll first, to make things more manageable. 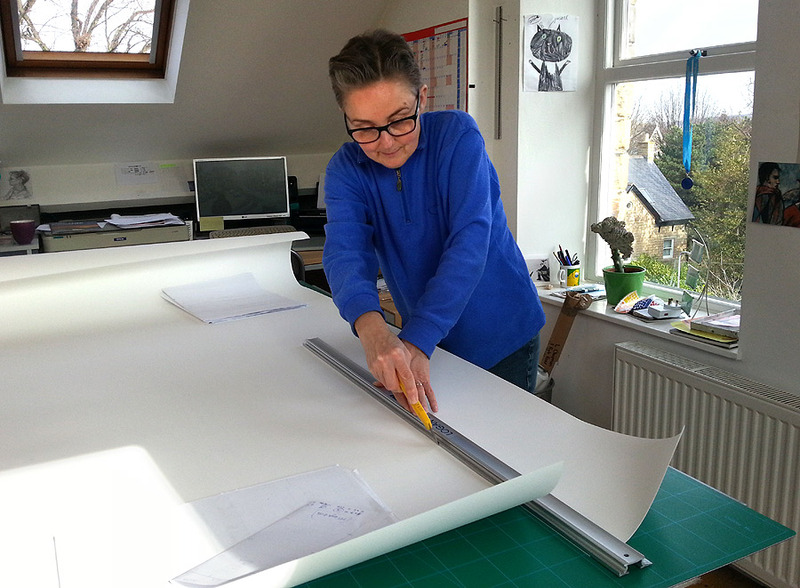 I had intended to get the lighter weight paper I usually work on, but at the last minute went for the 140lb instead, so the finished lengths will be more sturdy. Trouble is, that weight means the paper is really springy, so absolutely everything was a two-man job. Thank goodness for John! 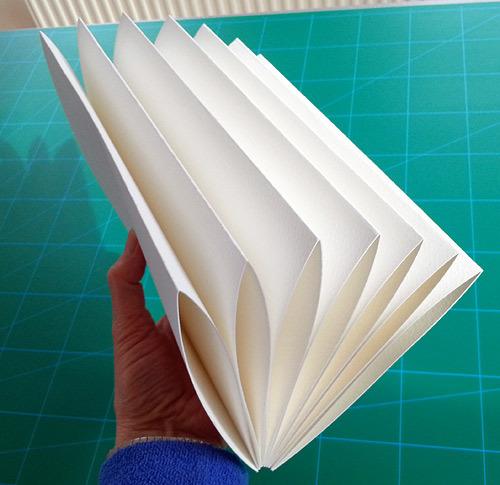 I thought long and hard about the order of things and realised that it made sense to do all the scoring (for the folds) before cutting the paper into the separate books. That way I could score across all 7 books at the same time, with only one lot of measuring. The books are going to be 14cm x 21.5cm, but you only need scores for alternate folds (because the folds go in 2 different directions), so we began by measuring out 28cm intervals down each of the 2m lengths. That too needed a jolly good wash but, once clean enough, it saved a lot of time at the scoring stage, as we only had to measure up each edge of the paper and not in the middle too. 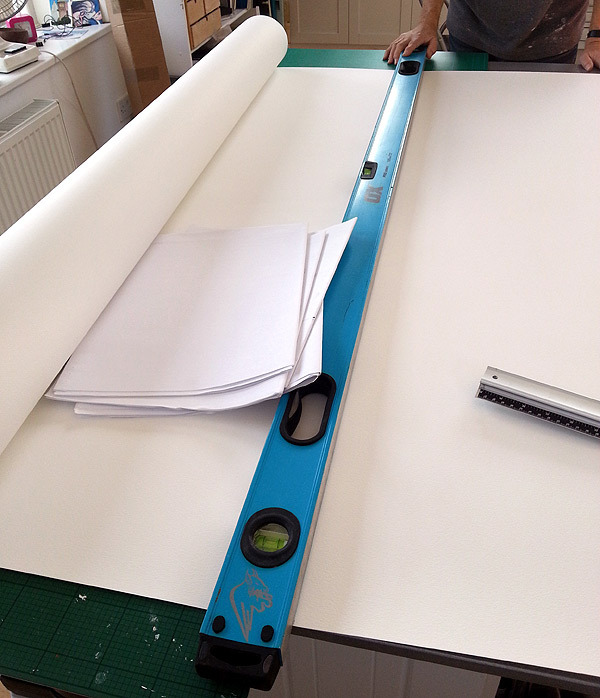 I had tried to use the spirit-level as a straight-edge for cutting across the width, but that was a BIG MISTAKE. It's depth interfered with the handle of the knife and so I have one rather raggedy cut, before I realised the problem. Ah well - it's a learning process. 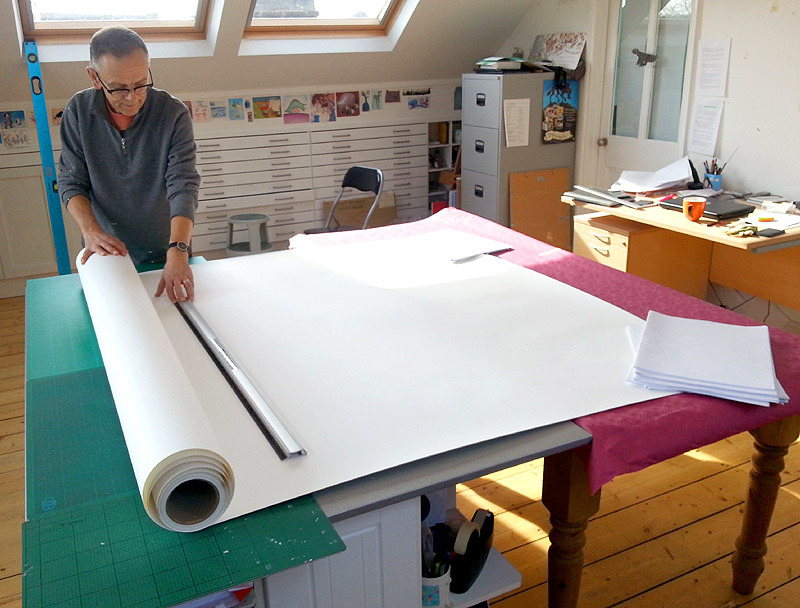 The thicker paper took a bit more man-handling and got chunky quite quickly, which was another reason I limited the length to 2m: 14 'pages' of 14cm. 300gsm paper certainly has very strong opinions of its own, so the experience was a bit like wrestling an octopus at times. The folded books are still pretty springy and rather keen to explode - I have put them under heavy books to see if that tames them at all. So that's the papers for 14 books done so far. I'll tackle another batch tomorrow, while I remember how we did it (and while the studio is clean). Although I must also get on with my book. Eek! Plus I also have to make a cover for the sketchbooks. Instead of individual covers for each book, which would take ages, I was given a great idea by my sketch-buddy Lucie Golton: a detachable cover which you use again and again. She made me one as a present a while back, so I can copy her system. 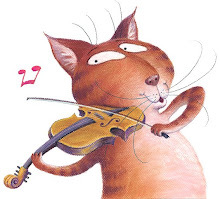 Thanks so much Lucie! I'll take some pictures as I make the cover, as well as showing you the finished item, but that's for next time. 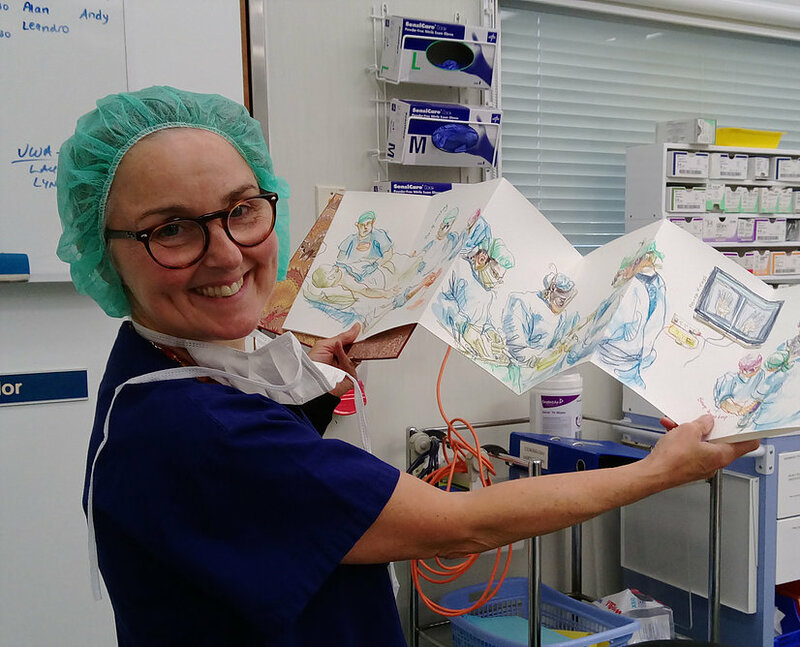 Hi Linne, I was sat to your side in Ketta's workshop, even though it is four years since July 2011 in Lisbon, I see that now you do your own and great..sketchbook..! Congrats! Hello! 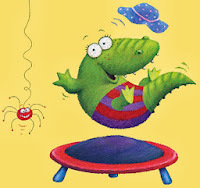 Yes, that was fun and a lovely book when we were done. I don't have the patience to do the lovely sewing system though. I've tried various quicker alternatives. I do like the concertina system - easy-peasy to bind and a fun format. Are you making your own? I am loving the preparation updates for this commission,I feel like I am with you in the studio getting ready! 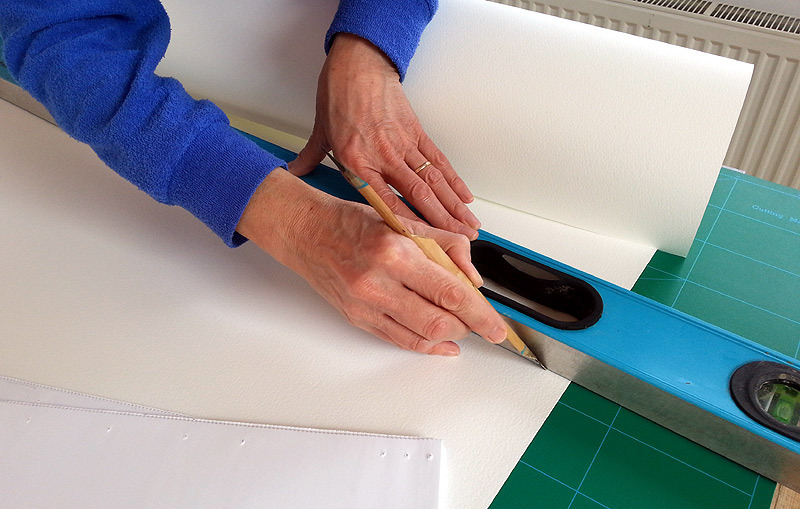 How lovely to have a budget and be able to spend money on such a big roll of watercolour paper and splash out on proper book binding materials.Enjoy making the rest of the books, they are looking great. Cheers Alison. Yes, it was a joy to have the proper materials and made me realise that, actually, it is worth it with the book cloth and endpaper, as it's not that much extra for a huge difference in ease. Excited to see your panoramas Marc! 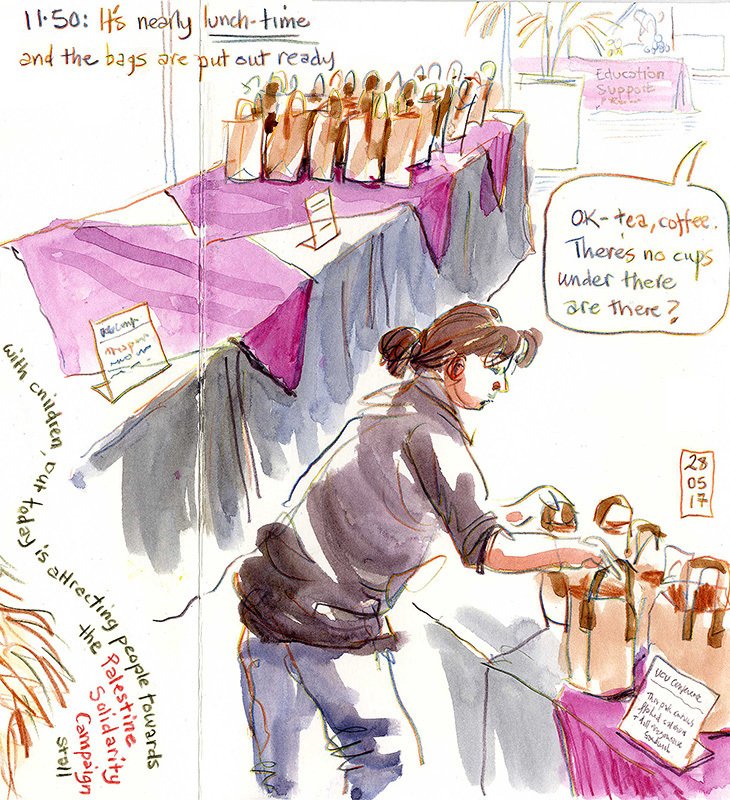 have you made your own books or have you managed to find a watercolour paper version? 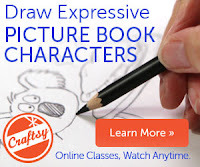 sketch book kids favorite book and this article tell me how to make a sketch book with easy way thanks for share it supporting statement for university .